Apple isn’t afraid to stir things up, making people rethink how they use technology. In recent years, most of that kind of innovation has focused on the iPhone, iPad, and iOS. But the MacBook Pro with Retina display, released at WWDC 2012, now directs attention back to the Mac. The Retina MacBook Pro is not only a groundbreaking release, combining stunning performance and portability in a 15-inch Mac laptop; this model will also force you to change the way you interact with a laptop. From overhauling how you view and work with content to how you deal with external devices and connections, Apple isn’t afraid to push its customers in new directions. The Retina MacBook Pro is certainly a more-than-gentle nudge. Side by Side: The differences between Retina MacBook Pro (left) and the regular 15-inch MacBook Pro (right) are subtle, until you look at the two side-by-side. The marquee feature of this laptop is right in the name—the Retina display. The Retina display made its debut in the iPhone 4, followed by the third generation iPad. It’s finally made its way to a Mac. You can look at the Retina display as another step in the iOS-ification of the Mac, or you can see it as I do—another way to remind you that all of these products are part of one big happy Apple family. The Retina display's numbers are mind-boggling: 2880 by 1800 pixels—that's 220 pixels per inch—for a total of 5.18 million pixels on a 15.4-inch backlit screen. When the Retina MacBook Pro is set at its (Best) Retina setting, it’s spectacular—the detail in photos is great, and text is the crispest and cleanest it’s ever been. For the first few hours with the Retina MacBook Pro, I even found enjoyment in reading the text of system alerts. The Retina MacBook Pro helped rekindle my appreciation for the little details of Mac OS X that, over time, I’ve taken for granted. There were no dead pixels or light leakage on the two Retina MacBook Pros I looked at, and compared to my 17-inch MacBook Pro, colors were exceedingly vibrant. With so many pixels, it’s easy to notice the amount of detail you can see in high-resolution photos. But it emphasizes the low quality of many website images. Fire up Safari and you can read an article displayed in finely rendered text, with images that now look jaggy. For anyone tuned to such nuances, it can be annoying, but don’t blame the laptop. It’s up to Web designers to start to optimize graphics for Retina displays. With the popularity of the iPhone and iPad, the addition of a Retina laptop, and the eventual adoption of high-resolution displays in non-Apple devices, it’s only a matter of time before the Web catches up. Videos on the Retina MacBook Pro look excellent. To display a 1080p video on MacBook Pro, the video is enlarged to fill the screen, since these MacBook Pros already have more pixels on the screen than on a HDTV. I didn’t notice any ghosting, and the laptop’s video card seemed to have no problem handling the video. 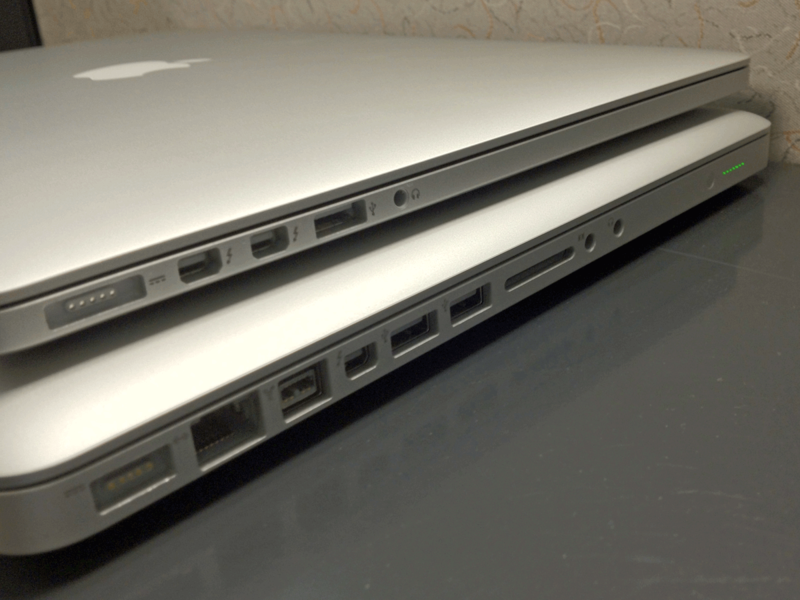 The Retina MacBook Pro actually has two video cards—one integrated, one discrete. The integrated video card (which shares memory with the main memory, and is actually part of the CPU), is Intel’s HD Graphics 4000, which is used to help preserve battery life. The discrete video card (a separate component with its own memory) is Nvidia’s GeForce GT 650M, with 1GB of video memory. The system automatically switches processors based on the activity you’re performing, so you’re not sacrificing performance while, say, playing a game. You can turn off automatic graphics switching, which then sets the Retina MacBook Pro to always use the discrete video card. Keep It Simple: The Display system preference for the Retina display (left) simplifies your resolution choices. When a second display is connected (right), you’ll see a listing of available resolutions. With 2880-by-1800 pixels on hand, you might assume that the list of available resolutions in the Displays system preference would be unbearably long—there are 19 resolution settings for my 17-inch MacBook Pro. But that is not the case. In its ongoing effort to ease choices, Apple revamped the Displays system preference for the Retina MacBook Pro. Displays offers only five choices on a scale, which makes it much easier to find a comfortable resolution setting. When a second display is connected and set up to expand the desktop, the resolution listing appears, specifically for the external display. When I connected the Retina MacBook Pro to my 42-inch HDTV, it instantly recognized the display, and when I turned off mirroring, I was able to choose one of four resolutions for the HDTV, and set the Retina MacBook Pro to one of the five settings mentioned above. 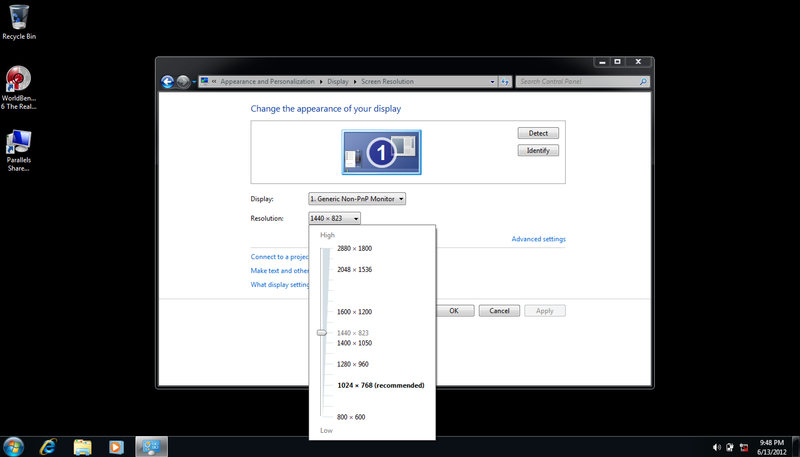 Doing Windows: Windows 7’s system preference does display a resolution setting of 2880-by-1800. I didn’t have a chance to install Windows on a Boot Camp partition, but Macworld Lab installs Parallels as part of the benchmark suite, and I ran Windows 7 full screen through the virtual machine. I was able to set Windows to 2880-by-1800, and I was able to use applications without a hitch. Our sister publication, PCWorld, is planning a deep look at running Windows on a Retina MacBook Pro, so look for that upcoming report. The Retina display also supports in-plane switching (IPS), which helps with color reproduction and viewing angles. Apple states a 178-degree viewing angle, and I don’t dispute that. A longtime concern about Apple’s screens is the reflective glare. With the Retina MacBook Pro, Apple redesigned how the display is mounted. There’s no longer a glass cover, and that, thankfully, reduces the glare. Apple says glare has been reduced by 75 percent; While I can't scientifically test that claim, I can say that the reduction is noticeable. I don’t have to work as hard to ignore the glare as I’ve had to on previous MacBook Pros. Soon after Apple announced the Retina MacBook Pro, the company discontinued the 17-inch MacBook Pro. With its support for 1920 by 1200 resolution—the native resolution of the 17-inch MacBook Pro—the Retina MacBook Pro serves as the replacement for the 17-inch model. I’m a 17-inch MacBook Pro user, and I use it because I want as much screen space as possible. 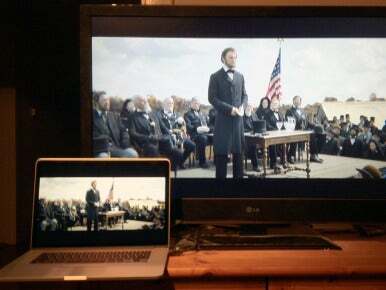 Can you get the same amount of space with the 15-inch Retina MacBook Pro? Yes, though the trade-off is that everything on the 15-inch screen is smaller than on a 17-inch screen. It doesn’t bother me one bit—yet. As someone who’s reached his 40s, I’m experiencing the change in vision that you expect when you get older, so it’s possible that folks with aging eyes like mine will need to make adjustments. High-Speed Connections: The Retina MacBook Pro (top) features two Thunderbolt ports, and a pair of USB 3.0 ports, one on each side. FireWire 800 and Ethernet are absent from the Retina laptop, but present on the regular 15-inch MacBook Pro (bottom). 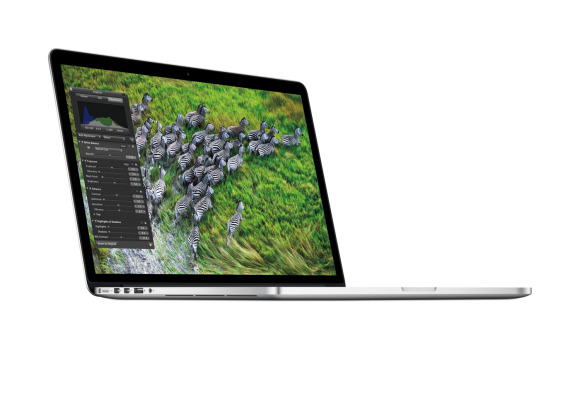 Apple offers two models of the Retina MacBook Pro. The $2199 model has a 2.3GHz quad-core Intel Core i7 processor, 6MB shared L3 cache, 8GB of 1600MHz DDR3 memory, and 256GB of flash storage. (Most people call it an SSD or solid state drive, but Apple calls it flash storage.) The $2799 model has a 2.6GHz quad-core Intel Core i7 processor, 6MB shared L3 cache, 8GB of 1600MHz DDR3 memory, and 512GB of flash storage. The Retina MacBook Pro processors are part of Intel’s Ivy Bridge processor technology, which are smaller and more power efficient than the previous generation of Sandy Bridge processors. Ivy Bridge processors are created using Intel’s 22nm (nanometer) 3D Tri-Gate process, while Sandy Bridge processors are 32nm processors. Ivy Bridge also supports several features that promote power efficiency. Essentially, it promises improved performance from a chip that requires less power. The processors support Intel’s Hyper-Threading, which creates two virtual cores for each physical core present in the processor. With the quad-core Core i7 processor, Hyper-Threading creates eight virtual cores. Also, the processors have Turbo Boost, where the processing cores automatically boost its speed past the specified rate if it senses that it is running under the power and heat limits. The 2.3GHz processor in the $2199 model can boost its speed to 3.3GHz, while the 2.6GHz processor in the $2799 model goes up to 3.7GHz. So Long, SuperDrive: In the Retina MacBook Pro (top), Apple uses the space that would usually be occupied by the SuperDrive (as shown on the 15-inch MacBook Pro, bottom) for a larger battery. 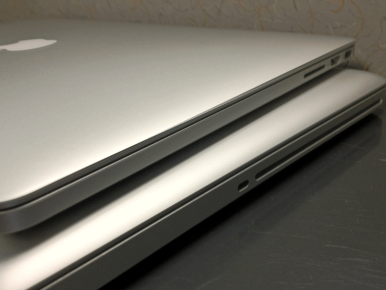 Before WWDC 2012, rumors of a 15-inch MacBook Air ran through the mill. While the Retina MacBook Pro is part of Apple’s pro laptop line—and Apple representatives stressed during the Worldwide Developers Conference keynote that the Retina MacBook Pro is a pro machine—it has definitely taken some cues from its smaller, lighter sibling. One obvious cue is with the body design; it’s thinner and lighter than its 15-inch counterparts in the “regular” MacBook Pro line. (More on the design later.) But not so obvious are the RAM and flash storage implementations—which may turn some customers off. In the Retina MacBook Pro, the RAM is part of the motherboard; there are no slots and RAM sticks, and you have to decide at the time of purchase if you want to upgrade from the standard 8GB to 16GB. You can’t upgrade the RAM after purchase. The situation is similar for the flash storage; it’s not permanently attached, like the MacBook Air, but it’s not considered a user-upgradeable part. Companies such as OWC offer flash storage upgrade kits for the MacBook Air, and chances are you’ll see similar kits for the Retina MacBook Pro, but you’ll possibly void your warranty if you use them, and Apple won’t support such aftermarket hardware. If your idea of a “pro” machine allows you to upgrade or customize some of its parts (like the Mac Pro, Apple’s most customizable computer), then the Retina MacBook Pro will be a disappointment. However, that message has been on the wall, starting with the unibody Macs introduced in 2008, and reinforced with the 2010 MacBook Air—you can even look to the iPhone and iPad. Apple did not change the design of the regular 13- and 15-inch MacBook Pro, so you still have the ability to upgrade RAM and storage later on in the life of those machines. Upgrading to 16GB of memory adds $200 to the price of either Retina model. Unfortunately, the $2199 model does not have an option to upgrade the 256GB of flash storage. The $2799 model has a 768GB flash storage upgrade for an additional $500. On one side of the Retina MacBook Pro, you’ll find a MagSafe 2 connector for power, two Thunderbolt ports, a USB 3.0 port, and a headphone jack. On the other side, there’s another USB 3.0 port, an HDMI port, and a SDXC card slot. USB 3.0 has long been on PCs, and it’s finally—finally!—made its way on to the Mac. With the widespread availability of USB 3.0 storage devices, Mac users will now be able to tap into the speed benefits of USB 3.0. The USB ports are compatible with USB 2.0, so you can still use USB 2.0 devices, though you won’t see an additional speed boost. HDMI Connection: You can connect the Retina MacBook Pro to an HDTV using the new HDMI port. Thunderbolt is the high-speed connector here. Thunderbolt’s specification states data throughput of up to 10 Gigabits per second (Gbps) per channel, though the actual speed depends on the connected Thunderbolt device. Thunderbolt is also used to connect displays such as Apple’s Thunderbolt Display ( ) or a Mini DisplayPort display like Apple’s 27-inch LED Cinema Display ( ). 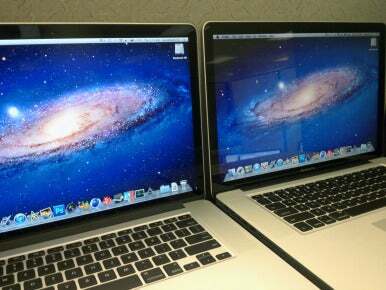 The Retina MacBook Pro can drive two external displays; you can connect a pair of Thunderbolt Displays, or a Thunderbolt Display and a Cinema Display, or even a display connected through the Thunderbolt port and a display connected to HDMI. With two displays connected, the laptop’s display is still available to use. What’s missing? Ethernet—the Retina MacBook Pro comes with 802.11n, and Apple sells a Thunderbolt to Gigabit Ethernet Adapter for $29. (You could perhaps use a USB to ethernet adapter, though I haven’t tried one.) There’s no FireWire 800, which I think is a bigger issue than the lack of ethernet, since FireWire devices are still common with Mac users. Apple will probably sell a lot of its new Thunderbolt to FireWire 800 adapters when they become available—it’s too bad it’s not an included accessory. There’s no Kensington lock slot either, so you’ll need to find another way to secure the Retina MacBook Pro to a desk.